Cross? Yes, I’m carrying a cross. Turning to look behind me, I survey the rest of our group. Walking beneath a straggly line of bobbing crosses are 30 people, young, old, male and female, of many different ethnicities. Their faces are calm; they are looking straight ahead or chatting quietly with their companions, carrying backpacks, wearing clothes ranging from a skirt and Tevas to jeans and a dress shirt. One guy in his mid-20s has a guitar strapped on his back, and another girl has a rosary wrapped in her fingers. Their posture is uniformly hunched to allow the crosses to extend forward, balanced somewhere between neck and shoulder. The only sound is the rushing of traffic mere feet away, while the crosses jut sharp lines into the bright blue sky. On this Good Friday, we are plodding single file along a busy street that ushers rush-hour commuters from a grittier section of Dallas into the manicured corporate lawns of Plano. 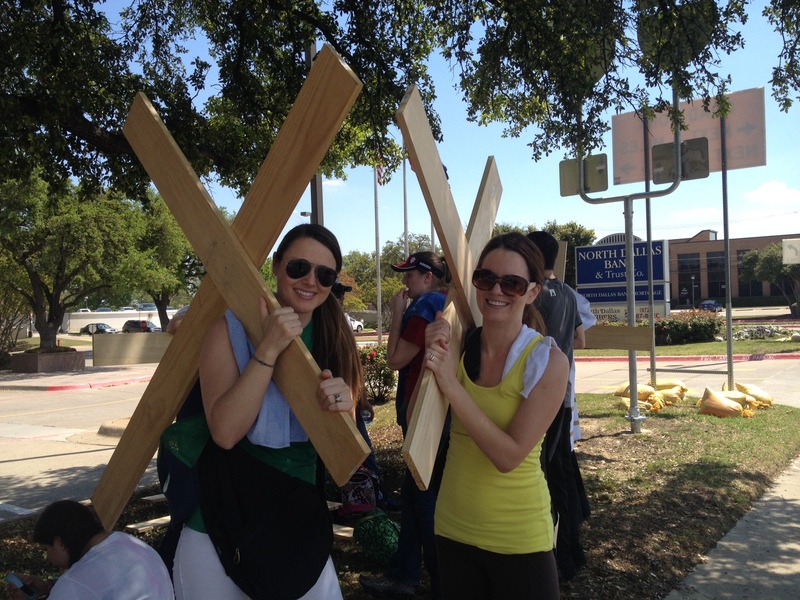 We are each carrying a 10-lb cross made of two four-foot pieces of wood nailed together. It’s not quite life size, but close enough to get the idea. The pilgrimage began this morning and will end at a busy upscale shopping and dining plaza later this evening. It is estimated the whole thing will take about nine hours, though many of us are only walking for a short interval. I have grown up looking at crosses from a distance, usually at the front of churches. I’ve attended all manner of them: Evangelical, Charismatic, Baptist, Methodist, non-denominational. Now, for the past six years, I’ve been Anglican and every Sunday I see the cross processed in, carried high on a pole in a procession of white-clad priests and acolytes. That cross is small and gold and shiny, and we bow to it out of respect. This cross, dull and clumsy and the unfinished shade of sand, comes closer to me than any of the crosses that looked down on me from above. It is literally in my hands. I have never actually carried a cross before and the reason I am carrying one now eludes me. It totally contradicts my introverted, non-confrontational nature. I know most people smile tolerantly when Christians reenact benign scenes from the Bible, like the baby in a manger or the empty tomb. It’s kind of cute. But as wrongful death is the centerpiece of this holiday, our public injunction is stark and somber. It feels uncomfortable to walk along the side of a road holding a wooden cross and subject myself to this kind of scrutiny. But that, I realize, is the point. Thankfully, I have a friend by my side. She suggested this Good Friday pilgrimage because she knows the leader and organizer, the pastor of a small evangelical church plant in Dallas. To be honest, my first thought was, “Well, I’m not doing anything else.” Plus, the reporter in me sensed a story. Plus, I like spending time with my friend. Though my motives were less than pure, I signed on for a three-hour segment of the journey, meeting the group at an Einstein Bagel for an afternoon trek that would finish five or six miles later at a Chick-Fil-A. I showed up at 1 pm wearing sunscreen and workout clothes; my shoes, a pair of aging Pumas, were about to prove sadly insufficient. (And yes, a pair of large sunglasses in case anyone might recognize me.) I also had a backpack with a few towels to pad my shoulders—a suggestion from the organizer—water and granola bars. My friend and I joined the group of cross-carriers who were pausing in the parking lot to read the crucifixion story. Then we lifted the crosses onto our shoulders, the leader received some instructions through a walkie talkie and we all surged forward like a creaky ship. So, here I am—a pilgrim in a strange metroplex, walking behind a Catholic priest. How many layers is he wearing, anyway? How can he breathe? I feel a sudden kinship with him, so I ask him if I can take a picture of him with my iPhone to show my husband, and he says, yes! He works at Prince of Peace, a Catholic church nearby. He is my age, maybe younger. “I feel like we should be singing,” my friend says. Marching and singing might seem appropriate. But I do not want to sing. I giggle nervously, praying that nobody breaks out into song. A few miles in, besides the pain in my feet, I notice the emotions I expected to be feeling—embarrassment, fear, anxiety—have almost dwindled to nothing. My mind feels totally empty. It only registers observations like: Hot. When people honk at us—which they do every few minutes, either in appreciation or disdain, it’s hard to tell—I jump a little but don’t feel concerned. On the other hand, the nobler emotions I had hoped for, a powerful connection with the man who hung on a cross this day thousands of years ago, are also absent. My friend and I walk side by side chatting about our jobs, husbands and kids. After about two hours, we take a break under some trees and my friend and I pass a water bottle back and forth. Despite the towels we are using to pad our shoulders, it is bruising our skin and leaving deep indentations. An elderly woman gets out of her car in a nearby parking lot and walks over to us to thank us for what we are doing. She asks to hold one of the crosses. A 20-something in a hipster tank top offers his. She struggles to grasp it in her frail hands and hoists it onto her shoulder. We smile at her. Apparently, I am not the only one who sensed a story. Reporters from Fox News arrive with cameras and notepads. A reporter begins interviewing members of our group and I can see more cars slowing down interestedly. What is going on? The word slowly travels down the line that there is an article about us on the Dallas Morning News website. Members of our group murmur excitedly and pull out their smart phones to look it up. I evaluate the journey thus far. Do I want to stop at this point? Not really. I feel oddly energized that I am completing a physical challenge and somehow proving to myself that I can hang with this crew, people I would ordinarily put in the “drunk-a-little-too-much-of-the-kool-aid” category. Maybe I do connect with something about this: the pageantry, part of the reason I am so drawn to the Anglican church. In our tradition, drama plays out as we observe and relive the church year. Plus, I love the raw elegance of the liturgy—which literally means the work of the people. On some level, it makes sense that I am now participating bodily in the story of God. Six years ago, at another Anglican church, I first walked the stations of the cross on a Good Friday, wondering what it was all about. A tiny precursor of what I am doing now. On the other side of the highway, my feet are throbbing. We continue to walk at a brisk pace and I ask the pilgrims behind us if they know how much farther we have to go. I am starting to want to complain a lot when I see the Chick-fil-a up ahead of us. We have been walking for approximately three hours. An SUV pulls up and in the back are cartons of water and snacks for the pilgrims. We help ourselves and sit down on the sidewalk with our backs to the wall, while the leader reads another section of Scripture. I immediately feel better. I have, even for just an afternoon, overthrown the despot of self. I have identified myself in a physical way with the sufferings of Christ. I have walked farther than I have in a long time. I’m still not sure why I did it but in a way I can’t explain, I’m glad I did. It was more than a spectacle. It added a new flush of color to the black and white biblical account. While I was doing it, I felt the camaraderie of associating myself with a cause. And really, it’s more than a cause for me: it’s a person that I have chosen to follow with my life. If he walked a long dirt road carrying a cross, I am (less) ashamed to be seen doing so along a major highway. If I am so far removed by my cultural surroundings, maybe I needed this excursion to wake myself from a suburban stupor. As we are picked up by a minivan and shuttled back to our cars, I wonder why I am tempted to try to neatly package this experience. It was messy, it was hot, it was confusing, a lot like the real deal. I don’t know that I will ever be able to put this experience into a category. And so, as I hugged my friend goodbye, I found myself thanking her for getting me so far out of my comfort zone that I am not sure if I can find my way back. I don’t know if I will ever do it again, but I do know that I don’t want to forget how it felt. I showed up at 11 a.m. sharp for my first Thursday lunch shift. Slipping on a pair of clear plastic gloves in a kitchen that reeked of vegetable steam and dish soap, I stepped hesitantly into a new world—that of the 55 plus. The sparse crowd in the sunny cafeteria stared at me curiously, as I was conspicuously younger than anybody in the room. “Are you new, honey?” someone asked, and I turned to see a beaming face with tanned creases and bright pink lipstick. “I’m Lee. I’ll show you what to do,” the old woman said briskly, showing me which pitchers held regular coffee, decaf coffee and hot tea, and how to fill the baskets with tea bags and cream. She trotted off on little white Keds and I followed her on her route, making sure each guest had something to drink as they arrived with canes, walkers and occasionally an oxygen tank. As I poured and chatted with a few of the men and women, the room filled up in anticipation of a hot catered meal and conversation with old friends. Everyone asked why I was there, if I was getting class credit. “I’m volunteering because I want to,” I said, telling them I was 28 and worked fulltime in the next town. This was my lunch hour, and instead of eating my peanut butter and banana sandwich at my desk, I was here to be an attentive and cheerful waitress. For the next year, I was a fixture at the Carlsbad Senior Center every Thursday, ready to wipe up spills, pass out salads and milk, listen to complaints and hurry to refill hot tea before tempers flare. It was never a chore for me—life made sense when I was there, when I could see those smiles and greet the regulars by name, when I got a tiny glimpse into who they were and the choices they’d made to become the people they are today. Take Lee, for instance. She became my favorite instantly, as effervescent as a hot air balloon. She knew I was getting married in a few months, and had one piece of advice: “Call him ‘my loved one.’ “ She lit up when she said that. “Say, ‘thank you my loved one.’ ‘How are you, my loved one?‘ ” Her eyes sparkled with pure enjoyment. From what I could gather, Lee’s life hadn’t always been perfect. Her husband died when she was 40, she told me, but she’d never remarried. Why? Because the gentlemen she dated were “better friends than lovers.” That meant she had been single and living alone for more than 40 years (by my rough calculations). But instead of mopey, she was radiant. Instead of pitiful, she was enviable. Not all the seniors I poured coffee for and cleaned up after were so charming. Many had sour countenances, stared blankly or refused to smile. Several never uttered a “thank you.” And patience was not their strong suit. At any given time if you looked around the room, you’d see four or five veiny hands shaking coffee cups in the air and looking downright peeved if you stopped at another another table before theirs. What makes you turn out one way or the other, I wondered? What makes the prim little woman so cross when she’s served tea a few minutes past the hour? What makes some people complain about a small piece of chicken and demand parmesan cheese on their noodles? And what makes people turn out scrumptious like Lee? There were others—Betty, who just got remarried after the death of her husband and loved taking leftovers home in old margarine containers, and Ray, who fought in three wars, survived his battleship sinking off the coast of Guam and recently won $11,500 at the casino. But the one who convinced me that I needed to rethink my own life was Lee, who relished her life. It was Lee who made me realize that my own pessimism would irrevocably twist my fate; my own despair, if I let it, would wither away my heart even as the years withered my body. The true beauty of serving lunch every week was that I got to see lives well lived and lives poorly lived. It’s possible to hide from the sum of your decisions when you’re young, but when you’re old, it’s plainer than your face if you are truly happy or truly miserable inside. What might be irritating on a 30-year-old is grievous on an 80-year-old. People don’t wear frustration and anger well at that age. And when you’ve been miserable for so long, it’s hard to change then. I had one other opportunity to work with seniors at a Jewish assisted living facility that year. My friend and I did a weekly current events, gossip and trivia show on a Tuesday evening. To our dismay, our audience dwindled from 40 to 3 and then, one evening, none. As we sat alone in the beige-walled multi-purpose room, we wondered what we had done wrong. We’d spent hours researching for our show each week. We made up quizzes and told personal anecdotes that must have been at least a little entertaining. And we talked really, really loud. We traced our demise to a black-haired woman in the back row, who muttered in a thick New Jersey accent “Let’s get oudda here,” to her friends, and they exited in the middle of our show. I knew then I didn’t want to turn out like that Jewish woman, bored and ungrateful, and I didn’t want to come out of adversity bitter and weary. It made me realize that I’d better decide quick what kind of life I’d like to live, what kind of disposition I wanted to have when I’m 85. That I had better start finding the extraordinary in the everyday or it would eventually become invisible. The oddest part was that everybody was so surprised that I would want to spend time serving them lunch and hanging around with senior adults. Did they not realize how delightful they were, how elegant Isthma looked in her pearls, how the couple sitting over there, so securely enthroned in each other’s presence, reminded me about the beauty and longevity of commitment? I absolutely adored these Thursdays, and these people. It was a privilege, and a treat, to escape a world of apathy, shallow comparisons and beauty contests. These people, many of them at the end of their lives, taught me how to live mine. Hypno-birthing: Yes, I did it. Disclaimer: If you are considering a hypno birth, what I am about to tell you may violate the code of ethics, which is, do NOT share your birth story with anyone until they have given birth themselves. This is not a birth story, but please stop reading now if you are pregnant, just to be safe. Have you ever tried to tell your body not to feel pain? It seems like a ludicrous idea. When you stub your toe on the couch and it’s throbbing like hell, you can try with all your might to stop feeling the pain, but does it work? Probably not. Yet that is the general idea behind hypno-birthing and medical hypnosis, and for many people like Jessica Alba, it works wonderfully. When I tell people that I did hypno-birthing, I often get the look, like, are you seriously that weird? Actually, I wasn’t into natural birthing or anything “weird” at all back then. When I got pregnant with my son, I had made up my mind that I was going to stick to the traditional medical model. I was afraid of giving birth and really didn’t think I could do it another way. Oddly enough, I knew two people, just friends of friends, who had just had unmedicated hypno births. For some reason that I can’t explain, I felt myself drawn to it. I sent teary Facebook messages to the moms with lots of questions. Does it work, really? How bad is the pain? Should I try to do this even if I’m a neurotic head case? I received answers that were vague but encouraging. They glossed over my questions about pain and called it “hard work.” Both had had beautiful experiences and felt in control of the birthing process from start to finish. “I’d recommend it to anyone,” one said. Oh, and they added nicely, my vocabulary would have to change. Contractions were surges. Labor was birthing. Pushing was breathing baby down. Etc. I would need to unlearn all birthing terms with negative connotations. So my husband and I signed up for a six-week class, which was essentially a natural birthing class like the Bradley Method with a twist: We women were trained in medical grade hypnosis to shut down parts of our body so we would not feel pain. Some people who are allergic to anesthesia, we learned, had been operated on successfully with hypnosis, and felt no pain. Great! Our class practiced self-hypnosis techniques to prepare for our birthings. We brought blankets and pillows from home and lay down on the floor for about half an hour at the end of class. We listened to our teacher read us a script. Our partners learned cue words to help keep us on track and to stimulate the anesthesia that we envisioned flowing through our bodies. (We were supposed to make it a color. Mine was purple.) To start the anesthesia, we used the finger-drop technique, in which you held your finger in the air and brought it down like a light switch. For this to be completely effective, we had to practice every day at home, and listen to CDs. The super helpful thing for me was the CDs. The cause of pain is tension, they said, and when you are completely relaxed, the tension dissolves, and with it, the pain. So we learned all kinds of relaxation techniques and positive thinking patterns. We did work to create a safe place in our minds to go when we needed a break. Then we created a “bubble of peace” around ourselves to keep negative thinking and comments from others from reaching us. The CDs also offered powerful affirmations and suggestions for every stage of the pregnancy. Even going into my birthing with a few lingering doubts, I was extremely calm. Hypno-birthing equipped me with everything I needed to have a relaxed, calm, peaceful, natural birth. I was prepared. I was never tense. I was never afraid. I knew that my body knew how to give birth. I’m so grateful for that. However, I did not just feel “pressure” as we had trained ourselves to believe. My purple anesthesia didn’t work. The birthing lasted more than 30 hours and it was far beyond my control. It was actually an incredibly painful experience and my memory of it has not dulled one bit over time. When I finally did give birth, I was almost too exhausted to care about my baby. BUT I immediately felt a surge of adrenaline that was like the best high ever, and I recovered within hours and was walking around. I’ve been told the power of hypnosis lies in the patient. I’m not certain that I ever really believed that self-hypnosis would work for me. Now, I completely believe in the mind-body connection and I know that hypno-birthing does work for some people! I suggest that anyone embrace the empowerment, the natural birthing tips and the relaxation techniques that hypno-birthing offers. Jeez, even though I’m not pregnant I still go to my safe place sometimes. I don’t regret doing hypno-birthing and I’m proud of myself for trying it. I am still a fan of natural birth. I am also a fan of the epidural I got with my second child. I know the goal of hypno-birthing is a better birth experience and that many instructors do not claim to offer a “pain free” experience (Thank God.) It’s definitely safe to say that it made my natural birth better in many ways. What would my birth have been like without the techniques, comfort and relaxation of hypno-birthing? I really don’t want to think about it. Time is a sweet ally and a cunning foe for a parent. Jack has a sweater. It’s a cute sweater made of fine gauge gray knit with stripes that swoop across the chest, just a little too small. For some reason, in the depths of summer, he decided to come downstairs wearing the sweater. Every morning. “Why, Mom?” he would ask. “I’m cold,” he promptly says. “Let’s go upstairs and pick out a different shirt,” I say. “No, I want to wear the sweater! I’m not hot!” he insists. I’m sure you’ve heard many parents talk about how “the days are long but the years are short”?… Uh, yes. It has never been so hard for me to get through the day, but all the repetitive moments do add up to “Oh my god, he’s four?” and a burst of pride when I see the spindly Crayola-red letters on his homework paper. So I’m stuck in heaven and hell. And to all you people I see in the grocery store who tell me to “enjoy every minute” or “I remember when my kids were that age. I miss it so much,” or “Those were the good old days” with a tear in your eye, you just make me feel guilty. Because no matter what you say, it does not make it easier for me to love all the little moments. The pace of life gets to me. Everything that takes the normal person seconds to do can take hours or never gets done at all. But can you remember how time felt when you were a child? Children live in the now and they live for pleasure. We were ignorant of time or the nature of time, how fleeting it is, how onerous. Growing up was a lifetime . All we cared about was how fast we could run. How far out our dresses swirled when we twirled. We cried so hard when our best friend hurt our feelings because that was all there was. The way we told time was through lost teeth, a first sleepover, a new pet, a bike with streamers on the handlebars, a favorite book. Oh yeah, and Christmas and birthdays. We were unapologetic hedonists. We lived hard. The way we live now is so squeezed and pulled and pushed that it seems like we are living in a sliver of reality. Time demands so much, and we put so many demands on it. Are we actually present in our bodies as we go through the motions of our day? Or are we somewhere else? I wonder if we can recover our values of play and pleasure. Can we sometimes enter into time with our children? I mean, it won’t work to forget the calendar or the clock. But in some of those moments that seem never-ending, that are stuck on repeat, it could be possible to free ourselves from expectation and constant productivity, and let our senses do the work. What is happening here? What is my body telling me? Who are these children and what joy do I find in their presence? What needs to be said or expressed? My spiritual director told me that telling your children, every day, “I’m so thrilled that you are my son/daughter,” will feed them for the rest of their lives. We’re in it, parents, every repetitive, irritating minute of it. So once or twice, let’s just press pause and… revel. I’m at a conference in Houston for the organization I write for, The Anglican Mission in the Americas. Between sessions, I am eating a lovely green salad in my hotel room and enjoying a little peace and quiet. It’s funny how being away helps to clear my head. For the past week I have been in a black mood and have not known why, or been able to explain it to my poor husband and children. Today, at a workshop on “How to Avoid Burnout,” I figured out why I have been so abysmally down. Duh! Oof. The definition of burnout is putting out more than you are putting in. So simple, it’s almost embarrassing. We are like cars. If the car runs out of fuel or needs an oil change, we don’t kick the car. It’s not the car’s fault. Cars need maintenance. So do people. But we punish ourselves for not being able to keep going endlessly on an empty tank, not asking ourselves what we need to be filled. It’s not American to not be productive, tireless and in motion. The workshop leader, an empathetic, bearded, flannel-clad priest from Atlanta, told us he suffered burnout after his church exploded in growth in 2002. He drove himself ruthlessly to keep up with the meetings, budgets, questions and buildings, ignoring all the signs of impending breakdown, until one night while watching TV with his wife, his whole face went numb. He thought he was having a heart attack, but soon realized it was a response to the incredible stress he had been under. He knew he had to make a change. The following week, the priest created a rule of life, or a specific plan to achieve what he needed to flourish. He based it on writings from Ignatius that describe a balance between the things that cause us desolation and those that offer us consolation. The priest made a long list of all the things he was doing that desolated (drained) him and the things that consoled (replenished) him. Then he began intentionally incorporating more of the things that consoled him, like prayer and meditation, reading fiction, exercising, etc. It wasn’t easy to reorient the way he spent his time, or managed the demands that still pressed, but it brought his soul back from the brink of death. Once he gave himself space to engage things that brought consolation into his life, he was able to achieve a sustainable lifestyle and continue leading his church. I sat there and took notes. I truly, deeply need consolation. I am a working mom and for a long time, most if not all my free time has been spent working on writing projects to supplement our income. Naptimes have gotten shorter but my deadlines have multiplied. The rest of my hours are consumed with childrearing, cooking, cleaning, volunteering at church and trying to maintain the relationships that are dear to me. The problem is, I am a contemplative and an introvert. I crave stillness and solitude. For the last few years, I have not been putting in as much as I have been putting out. Somehow I need to get full … and stay full. If only for that realization, it’s been a wonderful trip. It’s great in other ways, too. I love meeting these sweet, genuine people I write about, clergy and their wives. Many of them have read my writing and have kind things to say. Others are open about their problems and situations and I am honored to listen. It also doesn’t hurt that I have my own room at the Hilton with a king-size bed and fluffy robe. Have you ever been burned out? What did you do about it?